New, super fast heating technology starts vaping dry herbs in seconds. This herbal vaporizer is equipped has a large ceramic heating chamber for a generous herb packing plus an OLED screen for temperature display, battery meter plus more. 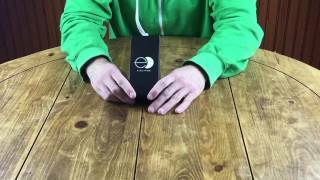 The E-CLIPSE dry herb vape is the latest in portable vaporizer technology. It is only 4 inches tall but has a battery to last and reach its peak temperature (435°F) in 30 seconds or less. Conveniently vape your herbs on the go without taking up too much pocket space. The E-CLIPSE vaporizer for dry herbs has an advanced OLED display with full temperature control (300F-435F). Fine tune your vapor experience by a single degree and with the high grade ceramic heating chamber, you will experience and exceptional true vaporization process. To ensure optimal performance and safety of the device, please read the entire instruction manual. 1. Especially with vapes, make sure to use a Herb Grinder to grind up the buds into smaller, evenly ground pieces. Try to avoid manual break up with the fingers, especially with dense nugs. 2. Remove the mouthpiece from the top of the heating chamber be gently pushing or pulling it off. 3. Fill the chamber with the ground up herbs. Pack the herbs in, but do not stuff them in because you will need airflow circulation. 4. Once packed, re-attach the mouthpiece to the top of the heating chamber. To turn the unit on and get started, just press the power button 5 times very quickly in a row. This is more or less standard for a Dry Herb Vaporizer, and even for the whole vape space. To turn the unit Off, just do the same thing and press the power button 5 times quickly in a row, and do not worry about pressing a sixth or seventh time. Do Note, the Auto-Shutdown is a safety feature that will automatically turn the vape pen OFF after 5 minutes - just turn it right back on if still needed, but this is just to make sure the unit does not continue to operate unattended in a bag, pocket or something else. 1. The temperature range for the E-CLIPSE vaporizer is from 300°- 400°F. 2. When the vaporizer is powered on, two temperatures will be displayed on the OLED screen. 3. The larger number is the desired temperature. To change the desired temperature setting, press the buttons to increase or decrease the temperature setting. You can also hold the button to change the temperature at a faster pace. 4. The small number is the current temperature of the heating chamber. That number will increase and decrease as the chamber heats and cools. 5. As the chamber is heating it will display the word "HEAT", and once you reach your desired temperature, the screen will display "WARM". 6. Press and hold the power button for 3 seconds to shift the temperature measurement from the Fahrenheit (°F) system to the Celsius (°C) system. 7. The E-CLIPSE comes with memory data function, so when you turn the vaporizer on again, it will automatically heat to the last set temperature setting. 1. During operation, a Low Battery will be indicated by a flashing red light. That means that you will have to recharge the device. The vape pen will shutdown if the battery becomes excessively low. 2. To charge the device, plug the provided USB cable into the micro usb port on the side of the vaporizer. ONLY use the charger provided with the vaporizer. Use of any other charger can be dangerous and damage the device. 3. As the vape charges, the blue lights will blink. A solid blue light indicates a full charge. 4. A full charge can usually be achieved within 3 hours. DO NOT overcharge. 5. DO NOT leave the vaporizer charging overnight. 6. DO NOT use the device while charging. 1. Make sure to power down the device before cleaning. 2. Remove the mouthpiece and empty the chamber completely. 3. Use the scraping tool and the cleaning brush to gently remove any excess particles inside and around the chamber. Important note: While using the vaporizer, parts of it will reach high temperatures. DO NOT clean or disassemble the vaporizer until all parts have cooled down completely. DO NOT immerse or subject the device to liquids of any kind. Warning: Internal Parts of the Vape Pen can reach high temperatures. Use caution when accessing the heating chamber. 2. Do Not puncture or incinerate. 3. Do Not dismantle for any cleaning or maintenance. 4. Do Not use if damaged. 5. Do Not touch the heating chamber area for at least 10 minutes after use because it will be very hot. 6. Use only provided power supply to charge the battery. Using any other power supply is dangerous and can damage the device.